Years ago, I saw a 4 wheel bike that I thought was the coolest thing, so I decided to build something like it. 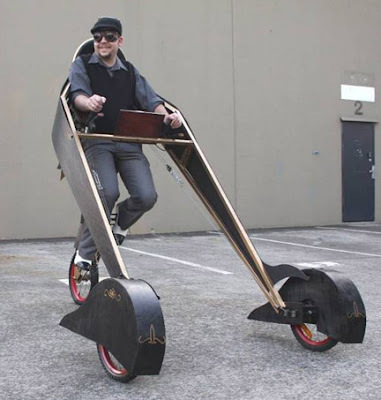 It was called the "Animas Quadracycle". It has full independent suspension, lots of ground clearance. It's like a human powered Jeep. 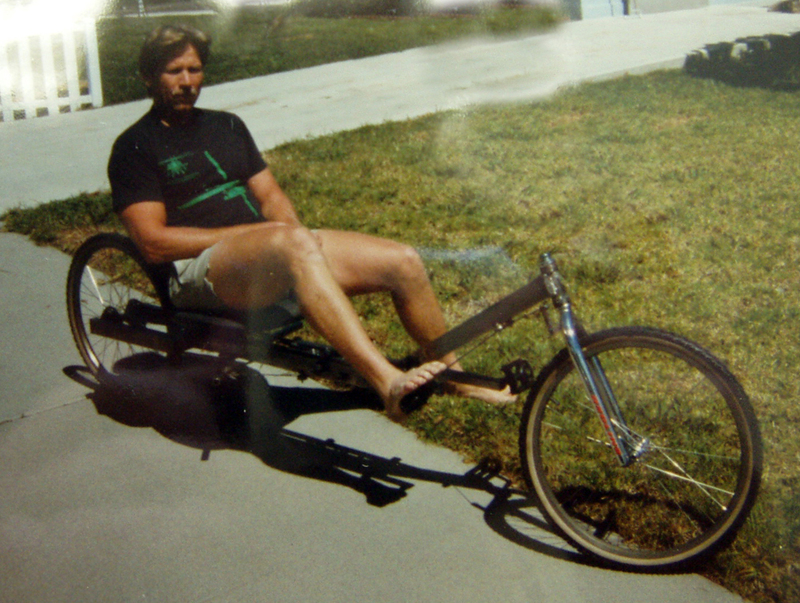 I got as far as the frame, wheels and transmission but the test rides did not go as planned. So, I set it aside and let it rust. Then, I found your site and bought some plans, 26 in all so far. I haven't made any bikes yet because we just moved into a new house with a big yard and I have a lot to do. But someday I will be building and with your plans I know things will go so much smoother that before. The other day I was looking at your new channel on YouTube and then I thought I'd look for the Animas Quadracycle and I found it. I really think you should give it a look. I just know that if you do you'll what to build one like it and then I can buy those plans from you and build my own. Take a look at it, you won't be disappointed. 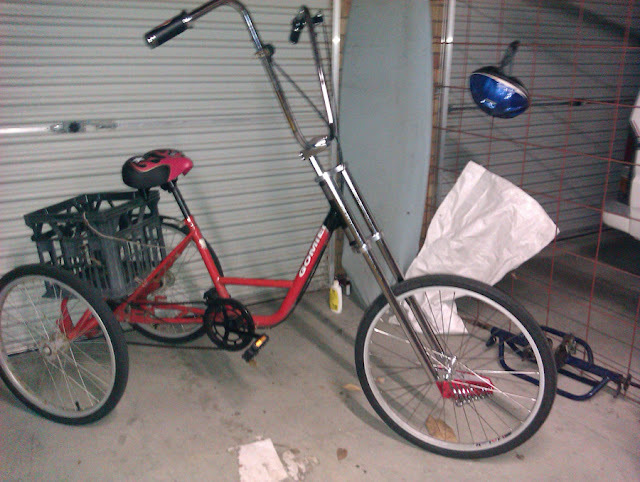 "This is my attempt at a trike. It's 7feet 4 inches long,just fits in a long bed truck. Future plans are for more trikes,but shorter wheelbase. Thanks for the inspiration to break out the sawzall and welder. Keep up the good work. Leo." "Thanks for the great plans and advice. Love seeing what other people are building. 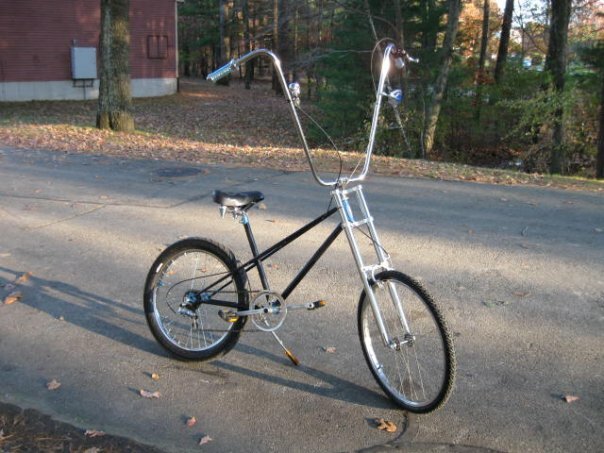 This bike is 8 feet 6 inches long. Also sending pic of bike sculpture, not rideable,but someone may figure how to make it rideable. Many thanks." Very cool, Leo. Thanks for sharing! "Hello, Fred from Conley,GA again. This was a 80s model girls 3 speed. It's pretty much my daily ride for now. I like the internal shifting I'd like to run across a 7 speed on a scrapper (good luck, right). I'm working on a Kyoto right now. It's my first custom that has multiple chain rings. It's going quite well so far. I'll send y'all a pic when I finish. Thanks for what you guys do. Fred." "Hi. 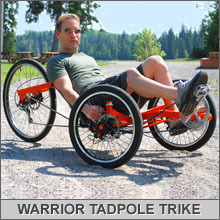 Attached is a pic of my Warrior tadpole trike. 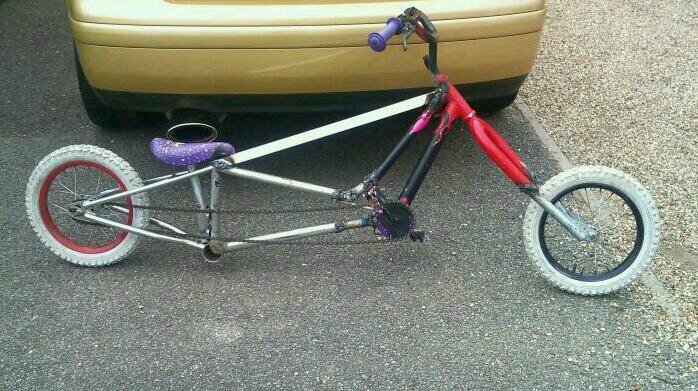 Ed, South Wales"
"What do you think of this cruzy trike? 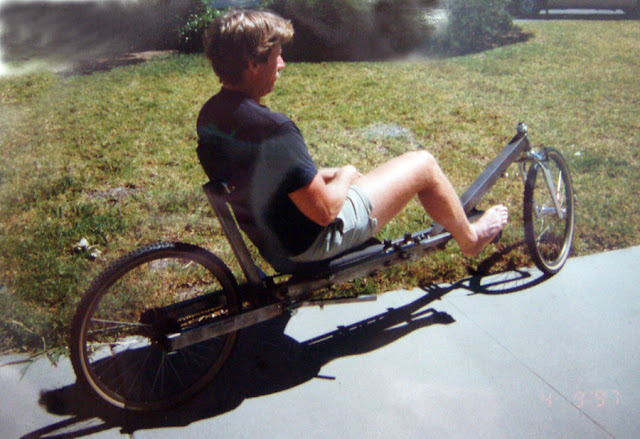 It started off as a standard Gomier Trike Then Mike at Little River Garage - Evans Head Help to create my trike. It isn't quite finished yet, though. 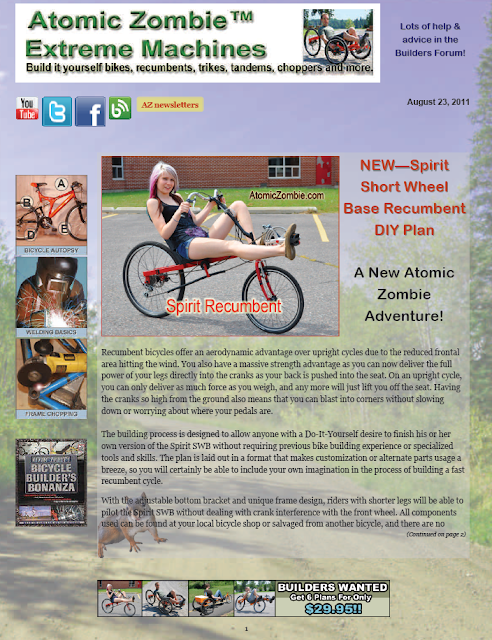 This and other Atomic Zombie newsletters are here. 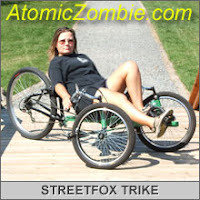 "I got my Streetfox done last weekend and I have but over 20 miles on it and no problems. 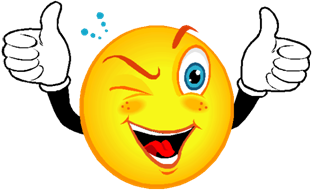 I would like to thank everybody on here for all the help and great ideas." Read more and join the discussion: It's done! 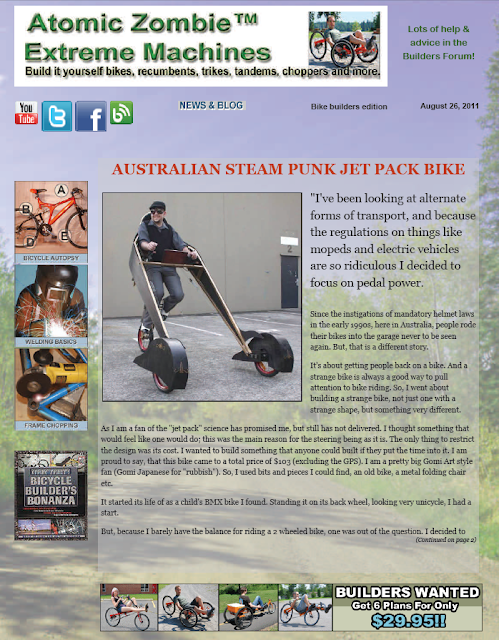 "Here are the 2 bikes I built with your plans. I did switch the seat as I need more comfort then just the padded seat you had in the plans. "The seats are actually folding fishing boat seats. I removed the folding mechanism and mounted them to the frame in the same manner as your plans showed. I wish you had something on your web site for making disk brakes or converting to disk brakes. Danny Harder." Australian steam punk jet pack bike - check this out! 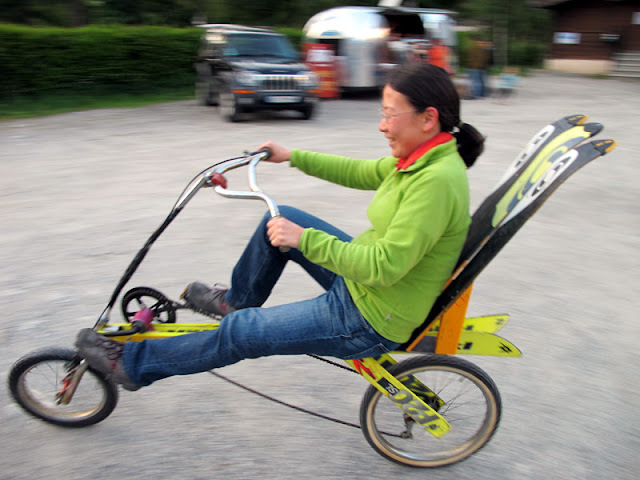 "I've been looking at alternate forms of transport, and because the regulations on things like mopeds and electric vehicles are so ridiculous I decided to focus on pedal power. Since the instigations of mandatory helmet laws in the early 1990s, here in Australia, people rode their bikes into the garage never to be seen again. But, that is a different story. It’s about getting people back on a bike. 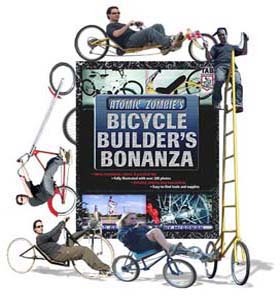 And a strange bike is always a good way to pull attention to bike riding. So, I went about building a strange bike, not just one with a strange shape, but something very different. As I am a fan of the "jet pack" science has promised me, but still has not delivered. I thought something that would feel like one would do; this was the main reason for the steering being as it is. The only thing to restrict the design was its cost. I wanted to build something that anyone could built if they put the time into it. 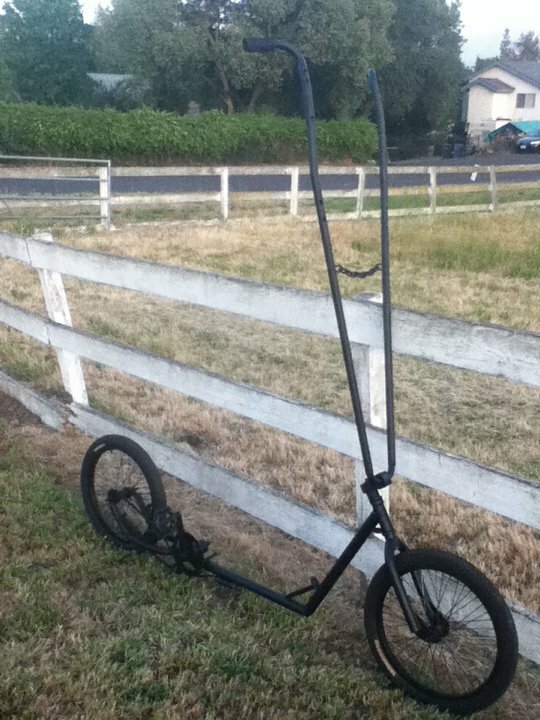 I am proud to say, that this bike came to a total price of $103 (excluding the GPS). I am a pretty big Gomi Art style fan (Gomi Japanese for "rubbish"). 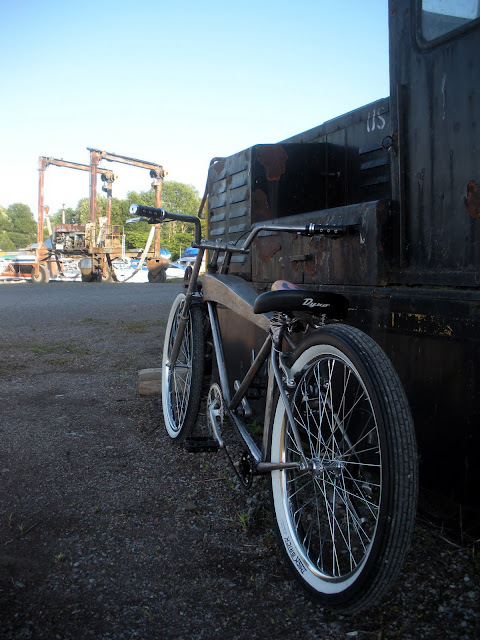 So, I used bits and pieces I could find, an old bike, a metal folding chair etc. 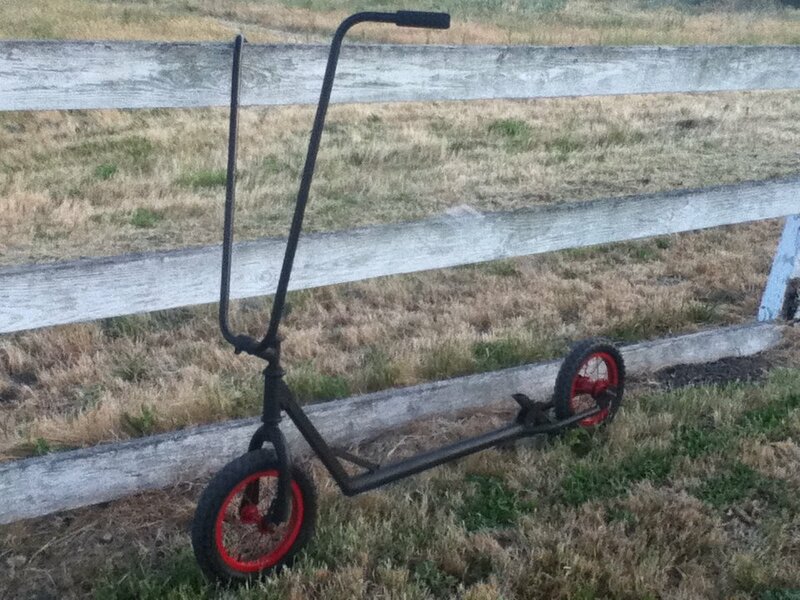 It started its life of as a child's BMX bike I found. Standing it on its back wheel, looking very unicycle, I had a start. pipes I had laying around. 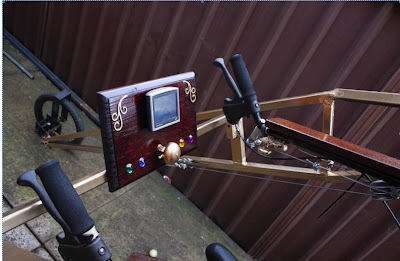 The steering is quite simple, even though it does not look it. Through a set of pulleys, the cable is pulled one direction or the other. All Steering and braking are done by the right hand control, (The left is kept free for a possible hub motor controller). Once it could steer, it needed to stop, which is done by normal bike brakes. Some longer brake cables had to be sourced, and the brakes had to be repositioned, but all in all not too difficult. At this time, I was asked to show the bike in a Steampunk exhibition, so lots of gold paint and 1900s steam style was added. I would hope that Jonathan Swift or H.G.Wells would be proud. Once climbing on board has been accomplished (done by facing out, holding onto the handles, putting one foot onto a peddle and stepping back and up) sitting on it is quite comfortable. Though higher than a normal bike, it feels quite nice (safe). Moving in a forward direction also feels nice, moving left or right is only a slight move of the controller. But, there is always a price to pay. When turning at speed, it tends to want to flip, well lift one wheel of the ground, which when you think about it is right, but it will scare the bejeezus out of you the first few times. The trick is not to try to fix it and put the wheel down. It will do that when you straighten out, but when you have become accustomed to it, it just adds to the look and fun of the bike. The GPS, The high-tech part of this vintage looking bike, is there more to tell your speed than your location. FYI, I have only taken it to 12 km/hr, fast enough for me. 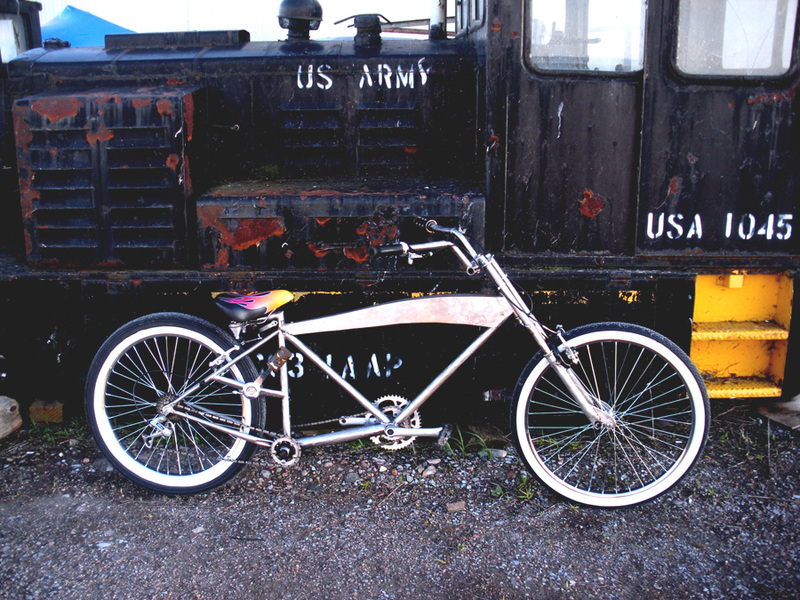 And, as the bike's intention is to be shown to inspire commuters to ride their bikes, speed is of little importance. Thanks for sharing your story and pictures, Tony. Very inspiring indeed, and you look very dapper! 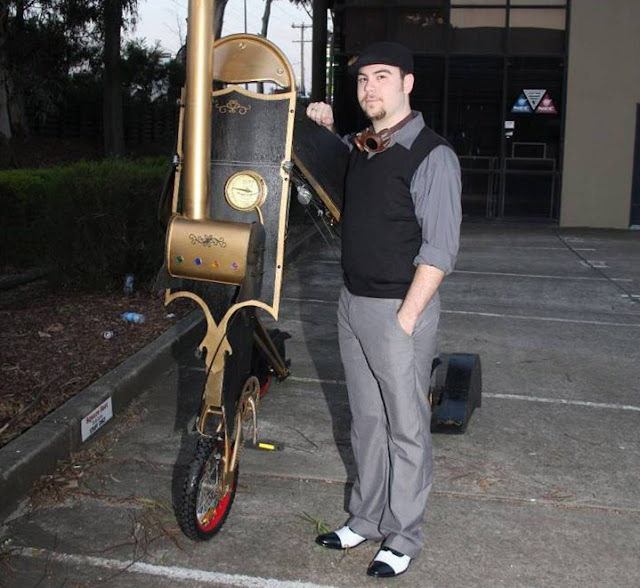 So inspiring that Brad says he wants to build a steam punk style chopper bike, too! "Hi all. I haven't been around for a while because of school and other projects, but I thought that I would warn you about a scam from India (the creator is from there). I did not go to that link just in case it had a java injection payload." Recumbent bicycles offer an aerodynamic advantage over upright cycles due to the reduced frontal area hitting the wind. You also have a massive strength advantage as you can now deliver the full power of your legs directly into the cranks as your back is pushed into the seat. 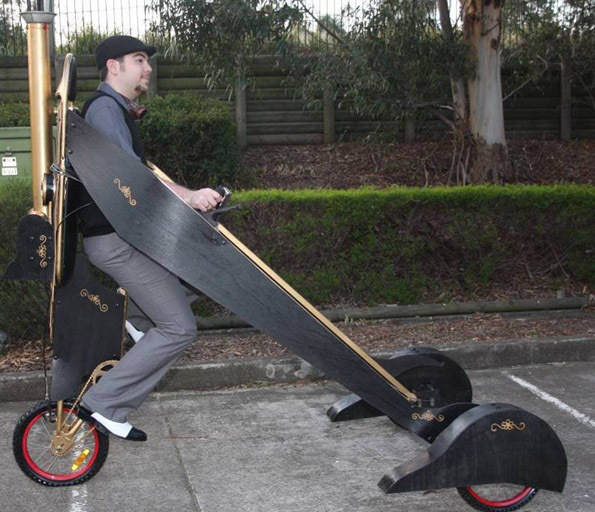 On an upright cycle, you can only deliver as much force as you weigh, and any more will just lift you off the seat. Having the cranks so high from the ground also means that you can blast into corners without slowing down or worrying about where your pedals are. 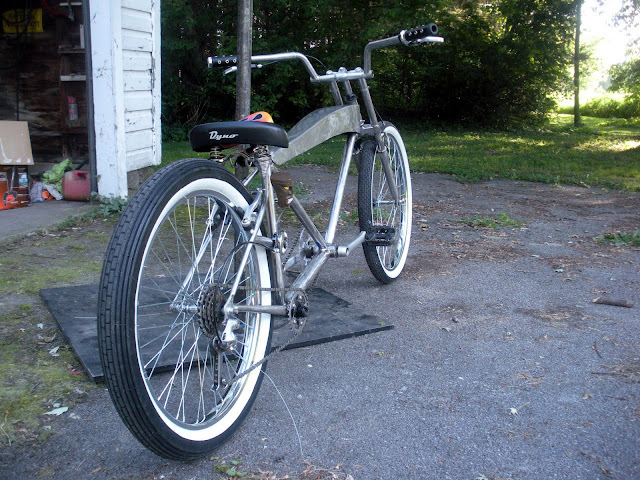 The building process is designed to allow anyone with a Do-It-Yourself desire to finish his or her own version of the Spirit SWB without requiring previous bike building experience or specialized tools and skills. The plan is laid out in a format that makes customization or alternate parts usage a breeze, so you will certainly be able to include your own imagination in the process of building a fast recumbent cycle. With the adjustable bottom bracket and unique frame design, riders with shorter legs will be able to pilot the Spirit SWB without dealing with crank interference with the front wheel. All components used can be found at your local bicycle shop or salvaged from another bicycle, and there are no machined parts necessary. There is plenty of room for your own design changes, and the Spirit can be built using the parts you have available to you. 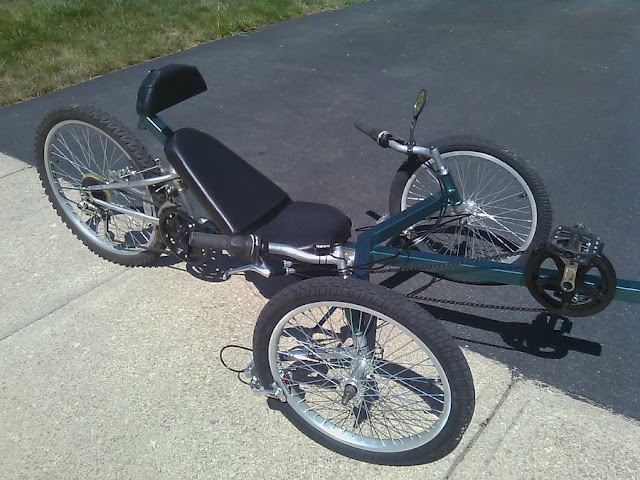 The TimberWolf combines the agile and speedy characteristics of a racing trike along with the comfort and practicality of a shopping trike to bring you the best of both worlds. 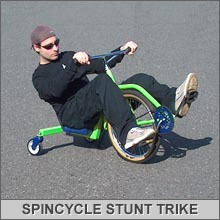 Having a seat height of 16 inches gives the TimberWolf a good stance for city traffic yet allows for some very agile handling characteristics with the ability to take corners at a much higher speed than what would be possible on an upright delta trike. The TimberWolf also includes rear suspension with a cargo area behind the pilot's seat, allowing fragile objects to be carried without risk of damage. The TimberWolf frame is extremely durable, yet light due to the thin walled square tubing design. There is only a single machined part on the entire vehicle - a small freehub axle adapter. Even the wheels and hubs are off-the-shelf parts, so you will not need to scrounge for any exotic or expensive components to build your own delta trike. 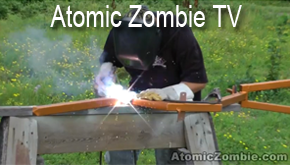 There is plenty of room for modifications, and anyone with a welder and basic tools can complete this project. "To other Canadians who are on journeys to defeat cancer and to live their lives, I say this: please don't be discouraged that my own journey hasn't gone as well as I had hoped. You must not lose your own hope. 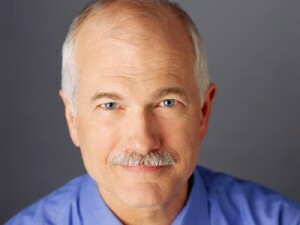 Treatments and therapies have never been better in the face of this disease. You have every reason to be optimistic, determined, and focused on the future. My only other advice is to cherish every moment with those you love at every stage of your journey, as I have done this summer." "My friends, love is better than anger. Hope is better than fear. Optimism is better than despair. So let us be loving, hopeful and optimistic. And we’ll change the world. 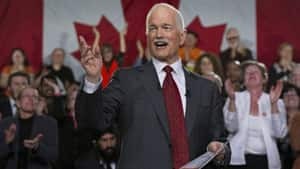 All my very best, Jack Layton." 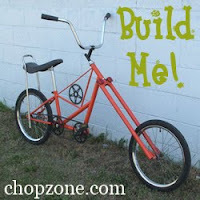 "My friends and I built these fun rides with some extra bike stuff we had laying around. "I designed and built this linear drive recumbent is 1992. Linear drive no crank. The purpose was to increase the power transfer efficiency. Thanks, Steve Kozloff." Street Fox with mid-drive in Westerville, OH. Built by Andrew. Long Wheel Base Recumbent - "Scrapper"
DeltaWolf + DeltaRunner + USS = TimberWolf!